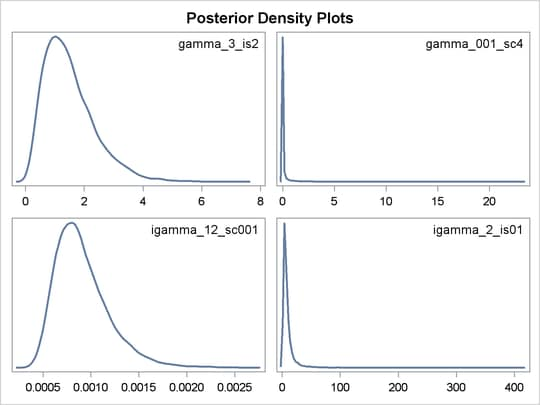 The gamma and inverse gamma distributions are widely used in Bayesian analysis. With their respective scale and inverse scale parameterizations, they are a frequent source of confusion in the field. This section aims to clarify their parameterizations and common usages. The parameterization of the gamma distribution that is preferred by most Bayesian analysts is to have the same number in both hyperparameter positions, which results in a prior distribution that has mean 1. To do this, you should use the iscale= parameterization. In addition, if you choose a small value (for example, 0.01), the prior distribution takes on a large variance (100 in this example). To specify this prior in PROC MCMC, use gamma(shape=0.01, iscale=0.01), not gamma(shape=0.01, scale=0.01). If you specify the scale= parameterization, as in gamma(shape=0.01, scale=0.01), you would get a prior distribution that has mean 0.0001 and variance 0.000001. This would lead to a completely different posterior inference: the prior would push the precision parameter estimate close to 0, or the variance estimate to a large value. The inverse gamma distribution does not have a mean when the shape parameter is less than or equal to 1 and does not have a variance when the shape parameter is less than or equal to 2. Note: This mnemonic might help you remember the parameterization scheme of the distributions. If you prefer to have identical hyperparameter values in the distribution, you should specify one and only one “i.”. When the “i” appears in the igamma distribution name for the variance parameter, choose the scale= parameterization; when the “i” appears in the iscale= parameterization, choose the gamma distribution for the precision parameter. The preceding statements specify four different gamma and inverse gamma distributions with various scale and inverse scale parameter values. The output of kernel density plots of these four prior distributions is shown in Figure 59.19. Note how the X axis scales vary across different distributions. Specifying the same number at both positions and choosing a small value has been popularized by the WinBUGS software program. The WinBUGS’s distribution specification of dgamma(0.01, 0.01) is equivalent to specifying gamma(shape=0.01, iscale=0.01) in PROC MCMC.